One of the lions guarding the Royal Castle. There have always been lions around the Royals in Sweden. It at least goes back to Birger Jarl who ruled the country in the mid 1200's. Birger Jarl is also attributed to have founded Stockholm. The lion is very nicely done too. I can see the details on the body. 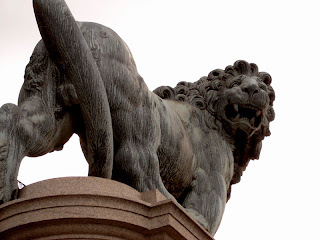 Most lion sculptures have smooth bodies.